one below is for Packers Fans. Along the Erie Canal, in each small town you visit, you will notice a statue of a mule (or two, or three). 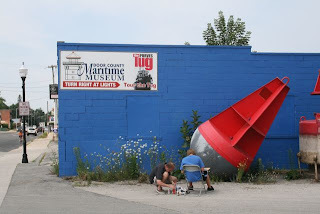 The street art is a tip of the hat to the original power source for canal boats. 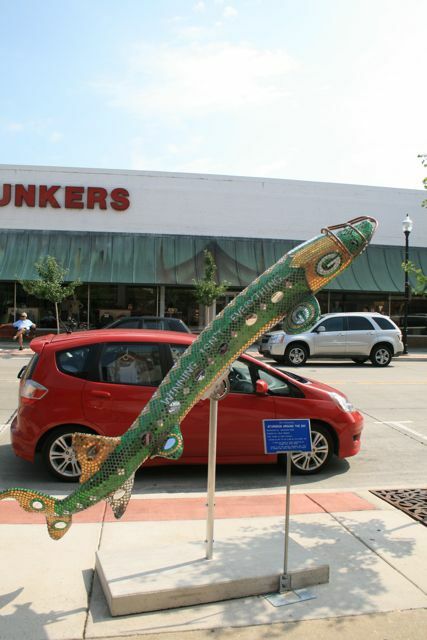 The statues are gaily decorated, each according to the talents of local artists. In Sturgeon Bay, Wisconsin, artists have turned their efforts to decorating statues of the eponymous fish, with some dazzling results. 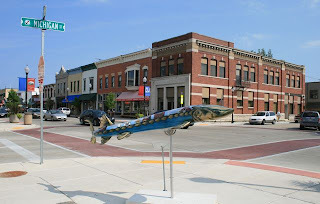 However we had decided to stop in Sturgeon Bay, not for the art, but for the Door County Maritime Museum, and the Wooden Boat festival. We biked over to the museum grounds on Saturday, and the first vessel we spotted (picture below) was most definitely not wooden. The Captain was instantly smitten and quickly pointed out the many ways in which an amphibious Cadillac would make an excellent dinghy. Of course it handles well in the water--it has FINS! Plenty of room for groceries! No need to dock it, just roll on up the boat launch ramp! Far more stylish than a Zodiac. Solid steel, like our canal boat. Alas, this boat was not for sale. There WERE many excellent wooden boats in evidence, including a gorgeous "Redbird" canoe made by hand from a plan by Ted Moore, the boatbuilder who designed and built the solar fantail launch we saw back in Peterborough, Ontario). My favoriate was a 1920s wooden ice boat, made to sail across frozen lakes. It had a bouncy trampoline net instead of a cockpit and three wicked looking monster ice-skate blades instead of a hull. "Let's see," mused the Captain. "The winter air temp is 20 degrees, the boat goes 70 mph, the wind chill is . . . nope, you wouldn't actually enjoy it!" There were also a couple of challenges for attendees. 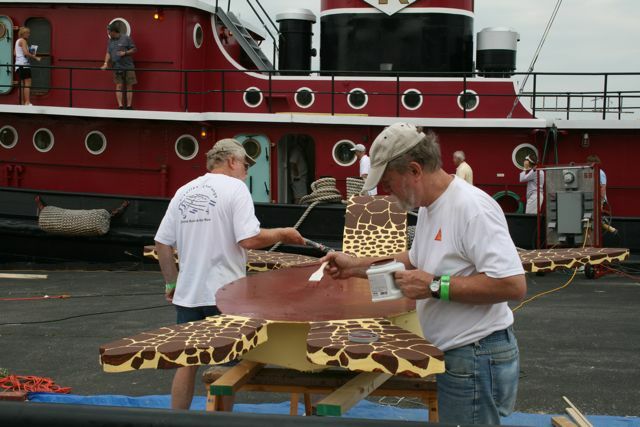 Challenge Number One: Build your very own boat, out of plywood, to your own innovative design in a single day. Next day, when the glue is dry . . . race it! One team of competitors was putting together a boat that resembled a recumbent Christmas tree, while another team was putting the finishing touches on a sea turtle that, if not streamlined, was definitely stylish. Challenge Number Two was for artists, who were sent out around town with a four-hour time limit in which to paint a maritime scene. Then, the finished paintings were auctioned off. I spotted this pair of artists as I headed to the town's Saturday morning farmer's market--and then saw their painting at the museum that afternoon. 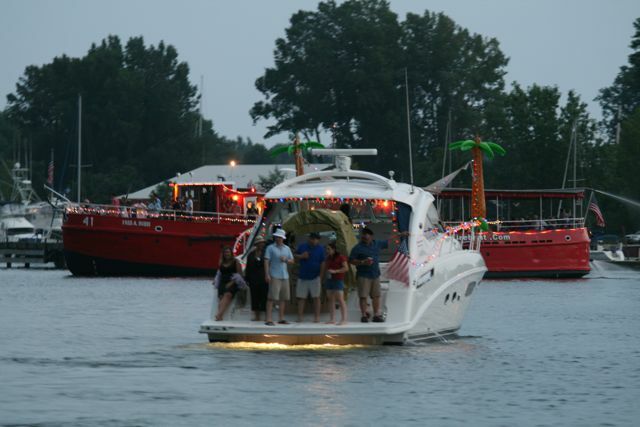 That evening, as the sun set, Dragonfly got a chance to be a piece of art herself--she was in a boat parade! 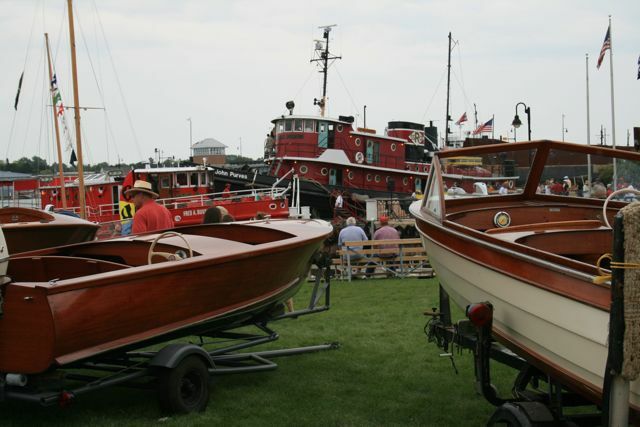 Here are some of the other boats on display: In the rear, a vintage Chicago fireboat, spraying water all the way, and in the foreground, the Minnow has found its way from Gilligan's Island to the Great Lakes. 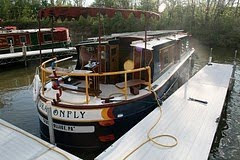 As befits a stately canal boat, Dragonfly displayed an antique boat lantern in lieu of fairy lights. And as we passed the judges' stand, though we didn't have a soundtrack, the Captain blew his conch. I was laughing at the Cadillac in the earlier post. I am not a boater but was at a wooden boat display in the Finger Lakes 2 years ago and marveled at the craftsmanship. Sounds like a fun time. We laughed at the Cadillac, too! 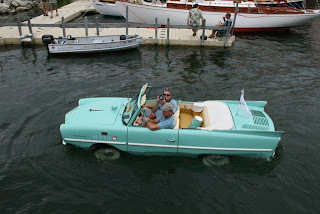 Not to geek out too completely, but it's not a Cadillac, it's an AmphiCar. Built in West Germany in the early 60s, with a Triumph straight-four mounted in the rear to clear the prop shafts. 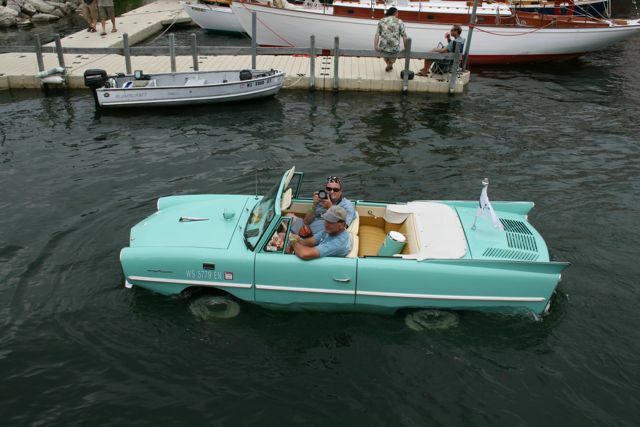 It's the only mass-produced amphibious car ever built. This looks like an awesome trip! I am reading through old posts now.